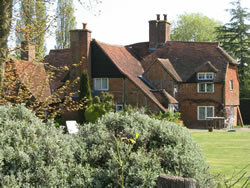 The village features 25 Statutory Listed Buildings, details of each are listed below. 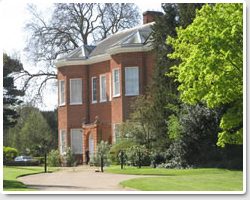 A statutory Listed Building is a "building of special architectural or historic interest". The Secretary of State for the Department of Culture, Media and Sport (DCMS) is responsible for the compilation and maintenance of the Statutory List. Recommendations for, and records of, Listed Buildings are maintained by English Heritage, which acts as the government's advisor on all additions and other alterations to the Statutory List. 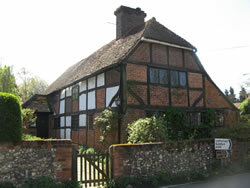 You cannot alter or demolish a Listed Building without permission from Guildford Borough Council (GBC). any objects or structures fixed to the building and can include freestanding items such as walls, gates and other buildings within the definedcurtilage of the listed building. 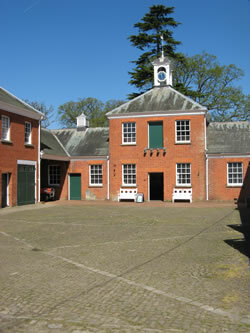 Grade II - These are buildings of special interest, which warrant every effort being made to preserve them. 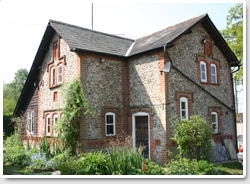 Can I alter, extend or demolish a Listed Building? 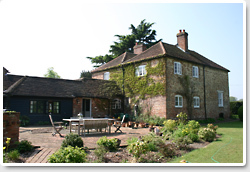 Statutory controls apply equally to all Listed Buildings, irrespective of grade. If you own a Listed Building, you need to apply for Listed Building consent for any changes you want to make that will affect the special architectural or historic interest of the property. The requirement to obtain Listed Building consent for works can also extend to objects or buildings attached to the building or located as freestanding structures within the defined curtilage of the Listed Building. The authorities look very carefully at any application to make sure that these features are not affected. You can visit Guildford Borough Council’s (GBC) planning pages where you can download an application form and guidance notes. 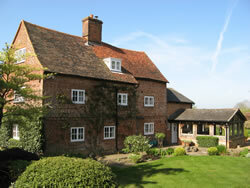 Where can I obtain advice on works to listed buildings? GBC offers guidance on repairs, extensions and new developments in discussion with applicants prior to submission of applications. You can also view supplementary planning guidance on residential extensions, residential design and shop front design by visiting the GBC Planning Policy publications page. 1. Old Harry's Cottage, Back Lane. C17 with C20 extensions. Timber framed underbuilt in red brick, with red brick infilling to square panel frame above; colourwashed to left. Brick extensions, tile hung on first floor to right, brick extensions to front and left. Plain tiled roofs. Two storeys with central edge stack. Diagonal bracing exposed on centre of first floor. Diamond-pane, leaded casement fenestration, 3 windows to centre of first floor, 3 plain casements to ground floor, gabled bay projecting to right with one first floor and two ground floor windows. Door to left hand return front (No. 11). 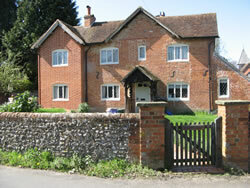 Further door to right hand return front in single storey brick porch with heavy gable. (Old Harry's Cottage). (Map Ref 27). TQ 05SE EAST CLANDON C.P. BACK LANE. No. 11 and Old Harry's Cottage (formerly listed as No 11 and No 12) II House. Extended to ends and now divided. 2. Boscawen Cottage (formerly Timbers Cottage), Back Lane. Early C17. Timber framed, underbuilt in whitewashed brick, exposed square panel frame above, with whitewashed brick infill. Plain tiled roof with end stacks, corbelled to right. Two storeys; 3 framed bays with diagonal tension braces to first floor left. Leaded casement fenestration with 3 windows to first floor. Two windows to ground floor. Half glazed door to centre. Pentice extensions to right end. C20 pentice extension across rear. (Map Ref 9). TQ 05SE EAST CLANDON C.P. BACK LANE. No. 15 (Timbers) formerly listed as No 15 (The Common) II Cottage. Early C17, altered in C19. Timber framed, largely exposed with brick infilling, red and blue brick cladding to left hand return front, tile hung on first floor of right hand end. Plain tiled roofs, half hipped with gablet to roof facing street. L shaped plan. Two storeys; double ridge stack to left and end stack to street. Entrance front: At right angles to street; gable to left with one framed bay to right. Tension brace exposed on first floor. 3 casement windows to ground floor. C20 door to centre of right hand range. Right hand return front: (rear) Two first floor casements and one first floor window over two ground floor casements in end of right hand wing. (Map Ref 16). TQ 05SE EAST CLANDON C.P. BACK LANE. 4. Holmhurst Cottage, Back Lane. Late C16/Early C17, extended in C20. Timber framed exposed to right half with brown brick infilling, red and brown, part colourwashed, brick to left. Plain tiled, half-hipped roof with gablets. Two storeys with tension braces exposed to first floor right. Large, multiple, ridge stack to left of centre end stack set back to right. Irregular fenestration of leaded casement windows; one window to first floor left, one through-eaves hipped roof dormer to right and one 3-light first floor casement to right. 5 ground floor windows. Door to right end in right hand return front; tile hung first floor. (Map Ref 15). TQ 05SE EAST CLANDON C.P. BACK LANE. C17 extended in C20. 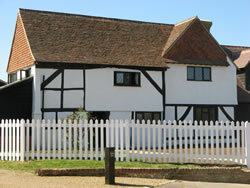 Timberframed, exposed to left with whitewashed brick infill; rendered cladding to remainder. Plain tiled roof. Two storeys with frame of thin scantling to left, exposed brace to 1st floor. One first floor casement window and one on ground floor. Ribbed wooden door to left with intersecting arched-head ribs. 2 external brick stacks to rear and modern extension. 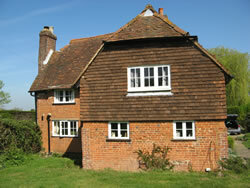 To right is Briar Cottage constructed in C20 using some reused timbers but not of special interest. (Map Ref 94 and 95). TQ 05SE EAST CLANDON C.P. BACK LANE. Lavender Cottage and Briar Cottage II House. 6. Tunmore Cottage, Ripley Road. Late C16/Early C17. Square panel timber frame with red brick infill on rendered and rubblestone plinth, plain tiled,half-hipped roof with end gablets. Two storeys; 3 bays with smoke bay to left of centre; front ridge stack to left of centre. Ogee bracing to end bays, first floor right and left, jowled angle posts. One 3- light, leaded first floor casement window. Blocked door in gabled porch to left. Newer entrance to right hand return front. Tilehung on gable to left end. Pentice extension to rear. (Map Ref 29). TQ 05SE EAST CLANDON C.P. RIPLEY ROAD. No 8 (Tunmore Cottage) GV II Cottage. 7. Home Farm House, Ripley Road. Late C17/Early C18. Brown brick, formerly colourwashed, with hipped, plain tiled roof. U shape plan with two wings at right angles to rear. Two storeys on plinth with plat band over ground floor and to eaves. Rear stacks to left and right. Regular front: 3 first floor sash windows under gauged brick heads, the outer ones with margin lights. Two ground floor windows very slightly cambered. Central 9 panel door with rebated stiles. Top 3 panels glazed under shallow, open gable hood on brackets; single storey extension to rear right. (Map Ref 7). TQ 05SE EAST CLANDON C.P. RIPLEY ROAD. Home Farm House GV II House. 8. 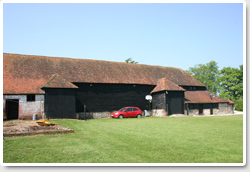 Home Farm Barn, Ripley Road. C17. Timber framed on brick plinth, with weatherboard cladding. Large, half- hipped, plain tiled roof extending down in catslide over centre aisle to front. Rectangular: Pigeon entrances to left under eaves. 3 ground floor casements below. Full height waggon doors to left of centre, adjacent to pentice extension, open on 3 bays to front. Included for group value . Barn, 5 yards South of Home Farm House GV II Barn. 9. Bay Tree Cottage, Ripley Road. C17, refronted in late C18, with C20 extension to front and to left end. Timber framed with red and brown brick infill to rear, red and blue brick cladding to front, brick and tile hung extension. Plain tiled, hipped,roof with gablet to right end. 2 storeys with gable lit attic to left hand extension, 1 storey and attic to right under a through-eaves casement dormer. L shaped plan with cross wing to left. Brick dentilled eaves, front stack to right, rear stack to right and double stack to right of centre on ridge. One C20 casement window on each floor of crosswing, 3 ground floor casements to right, are diamond-paned under cambered head. Part glazed door to left of centre under open gabled porch. Right hand return front: (Facing the Street): One through-eaves dormer and dated brick inscribed "IH 1778". (Map Ref 47). TQ O5SE EAST CLANDON C.P. RIPLEY ROAD. 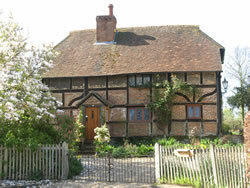 Bay Tree Cottage GV II House. 10. Frogmore Cottage, Ripley Road. Early C16. 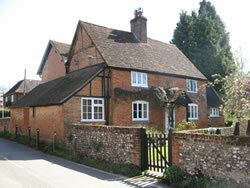 Timber framed, underbuilt in red brick with brick infill to exposed frame above; plain tiled hipped roof with gablets. Two storeys; four framed bays including chimney bay. Arched bracing to first floor. Gabled, tile- hung casement dormer to right. End ridge stack to left, main ridge stack to right. Irregular, diamond pane, leaded casement fenestration. 3 windows on first floor and one window between floors, window on left. 3 windows on ground floor. C20 door to right. Pentice extensions to ends. (Map Ref 30). TQ 05SE EAST CLANDON C.P. RIPLEY ROAD. Frogmore Cottage II Possible hall house. 11. Pond Cottage, Ripley Road. Dated 1863 and built by the Lovelace Estate. Flint rubble with ironstone galleting in brick dressings with terracotta decoration. Slate roof extending in Cotshole over weatherboard and brick extension to left. At right angles to road. Two storeys, two rebuilt corbelled stacks to left. Right hand return front: gable end with deep eaves. 2 first floor,cambered-head windows under brick label mould stepping up to enclose oval terracotta plaque with Lovelace Arms in gable apex. 3 cambered-head ground floor casements under continuous label moulding one casement to left in pentice extension. C20 panelled door in set back bay to right. Rear: (facing pond) Band of terracotta panels with quatrefoil decoration to plinth. 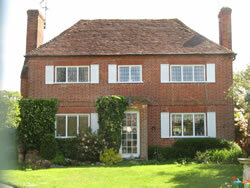 Cambered head casements in brick-dressed surrounds. (Map Ref 1). TQ 05SE EAST CLANDON C.P. RIPLEY ROAD. 12. Tunmore Farm House, Ripley Road. Late C17/Early C18. 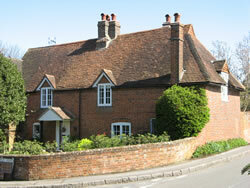 Red brick with hipped plain tiled roof. Two storeys with plat band over ground floor, brick dentilled eaves. Detached end stacks to left and right, offset to left. Regular three bay front with casement fenestration under gauged brick heads. 3 windows on first floor, 2 below. Central, flat roofed brick porch with dentilled brick stringcourse. Former door, now glazed, in chamfered brick surround. Entrance to left hand return front. Tile hung wing at right angles to rear. (Map Ref 18). TQ 05SE EAST CLANDON C.P. RIPLEY ROAD. Tunmore Farm House GV II House. 13. 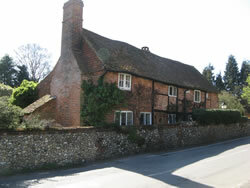 Yew Tree Cottage and Wildrose Cottage (formerly Sawpit Cottage), The Street. Mid C18. Random flint rubble with brick dressings under hipped, plain tiled roofs. Two storeys with wide brick quoins to angles. Central corbelled ridge stack and end stack to right. Leaded casement fenestration with 4 windows across the first floor and four plain casements below; those to left and right of centre under cambered heads. 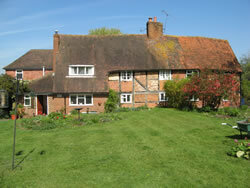 Door to left (No 1 Yew Tree Cottage) and door to right of centre (No 2 Sawpit Cottage). (Map Refs 50 and 51). TQ 05SE EAST CLANDON C.P. THE STREET. No 1 (Yew Tree Cottage) No 2 (Sawpit Cottage) II Cottage pair. 14. Church Cottage, The Street. Late Cl7, extended to left in late C18. 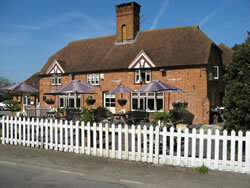 Timber framed with timbers of thin scantling exposed to centre and right, brown colourwashed brick infill, red and blue brick extension to left. Plain tiled roof with tile hung gables. Rectangular 3 framed bays with one bay to left. End stack to left and rear stack to right. Two storeys with irregular leaded casement fenestration, two windows on first floor to right, one to left. 4 windows across the ground floor, two to left under cambered heads. C20 part glazed door to left. Pentice extension to rear. (Map Ref 56). TQ 05SE EAST CLANDON C.P. THE STREET. 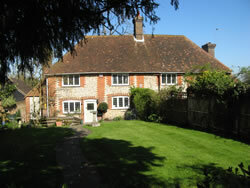 Church Cottage (formelry listed as No 1 and 2 (Church GV Cottages) II Cottage. 15. Church of St Thomas of Canterbury, The Street. (Map Ref 46). TQ 05SE EAST CLANDON C.P. THE STREET. Church of St. Thomas of Canterbury GV I Church. 16. Lamp Cottage, The Street. Late C16. 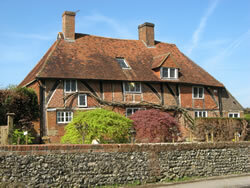 Timber framed with colourwashed brick infilling and some colourwashed render infill; half-hipped plain tiled roof. At right angles to street, entrance front to left. Two storeys on plinth; 3 framed bays with one C20 bay to left end, ogee tension braces to angles of first floor. Corbelled stack to right. Irregular leaded fenestration with two windows on first floor, 3 windows below under pentice drip boards. Hip roofed porch projecting to left with part-glazed door facing the street. Street front: One first floor and two ground floor casements. Flint plinth to pentice extension across rear. (Map Ref 57). TQ 05SE EAST CLANDON C.P. THE STREET. Lamp Cottage GV II Cottage. 17. The Old Forge, The Street. C16 with C17 main range to rear. Timber framed old range at right angles to the street; frame of thin scantling with brick infill on first floor underbuilt in brick. C17 brick range parallel to street to rear; raised in C20. Plain tiled roofs, lower and hipped over cross wing. T shape plan with taller range to rear. Large ridge stack to left of centre on rear range, ridge stack on crosswing facing street. Two storeys, plat band over ground floor to rear, gable lit attics to left end. One casement window on each floor to left, one casement window on cross wing. Large angle bay to end right under hipped roof. Half glazed door in re-entrant angle under flat hood on metal brackets. Single storey slate roofed extension to left, double casement doors. Single storey extensions to right. (Map Ref 99). TQ 05SE EAST CLANDON C.P. THE STREET. 18. Old Manor Farm, The Street. C16 Timber Framed, clad in red and blue brick with plain tiled roof, hipped to right. L shaped plan with wing to rear right. Two storeys on tall plinth, plat band over ground floor. Two narrow, gabled casement dormers to roof, with 3 first floor casements on first floor. Central window single light, outer windows 3-light. Two ground floor, 4-light casements under red and blue brick relieving arches. Part glazed door to centre under gabled brick porch with Tudor style arched entrance on impost string course across the front. Tudor style arched panels to sides. End stack to right and stacks to rear. (Map Ref 40). TQ 05SE EAST CLANDON C.P. THE STREET. Old Manor Farm House II House. 19. Queens Head Public House, The Street. C17, extended to rear right in C18/C19 and to left in C20. Timber framed core, exposed in gable end of rear wing, brick infilled; red and blue brick cladding to front and on extensions. Plain tiled,half-hipped roof. Two storeys with massive, square stack to centre of ridge with arched panels on sides and rebuilt, raised top. One 3-light eaves dormer to left with tension braces to gable and zig-zag mouldings to edges. Similar dormer to right. One 3-light, under eaves casement to left. Two large 4-light ground floor windows under cambered heads with tiled infilling under the arch. Half glazed door to central, lobby entrance - now blocked. Single storey brick extension with further door to left end. Further door in right hand extension. (Map Ref 53). TQ 05SE EAST CLANDON C.P. THE STREET. Queens Head Public House II House; now Public House. 20. The Old Parsonage, The Street. C17 origins, remodelled and extended in late C18 and early C19. Whitewashed render front under hipped, plain tiled roof, whitewashed brick range to rear, tile hung on first floor with brick dentilled eaves to plain tiled roof. Two storeys with offset end stack to right on front; corbelled end stacks to rear. 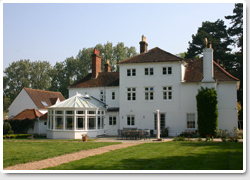 Symmetrical front with 12-pane glazing bar sash windows in architrave surrounds. 5 windows on first floor, 4 windows on ground floor. Central 3/4 glazed door on ground floor in fluted surround with shallow flat hood on volute brackets, geometric pattern band over the door. Taller range to rear with single storey extensions to ends. The Old Parsonage II House. 21. Warren Cottage,School Lane and Hollyhocks, The Street. C17 with Cl8 cladding and extensions, restored in C20. Timber framed, exposed on right hand gable end, brick infilled. Red brick cladding to left and right; parallel range plain tiled roofs. Two cottages back to back at right angles to street. Left hand return front: Entrance front of Warren cottage. 2 storeys with deep eaves on brackets. End ridge stack to left, rendered plinth to ground floor. Regular front with central gable, 3-light, cambered head diamond-pane leaded casement fenestration: 2 windows to each floor. First floor window to centre blocked. Central planked door in open gabled porch on "rustic" tree-trunk supports. Pentice extension to ends. Right hand return front: Entrance front of Hollyhocks. Two storeys with plat band over ground floor and central ridge stack. 3 light casement fenestration with one diamond-pane leaded window to first floor right. Two windows on each floor, those on ground floor under cambered head. Central door in open gabled porch. Pentice extensions to ends, weatherboard to right. (Map Refs 59 and 60). TQ 05SE EAST CLANDON C.P. THE STREET. Warren Cottage and No 10 (Hollyhocks) GV II See Also School Lane. Cottages. 1756-7 for Admiral Edward Boscawen, interior designed by Robert Adam (his earliest dated work) in 1759. Alterations to west front and staircase added by Joseph Bonomi in 1797 for the Sumner family. Main entrance transferred and porch added in C.1890 by Halsey Ricardo for Lord Rendel, music room added to north end of west front in 1903 by Sir Reginald Blomfield. Red brick on stone plinth with low pitched, hipped slate roofs. Original house half-H shape with entrance front to west, now with extensions to north and new entrance to east. 2 storeys to east and south fronts, 2 storeys and attics to northern service wing and west front of main house; single storey music room. Entrance front (East): Modillion eaves cornice with rear stacks to left and right. 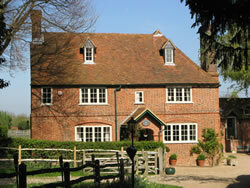 Main house with two storey angle bays flanking recessed, 3 windowed centre range. 12-pane glazing bar sash fenestration. Single storey projecting porch (1889 by Halsey Ricardo with concave sides containing arched niches. Flat front, rusticated with pilaster-piers surmounted by stone spheres. Arched,traceried fanlight over double doors of 6 fielded panels. Service wing set back to right. 2 storeys and attic, glazing bar sash fenestration, 4 windows on each floor, squat windows to attics. Two stacks, one to right end. Left hand return front:- (South) 2 storeys, 7 bays with central bay angled and projecting. Glazing bar sash fenestration. Rear: Old entrance front: 2 storeys and attic with modillion eaves, 5 bay front, central bay in shallow break under small pediment. Glazing bar sash windows. 7 windows across first and attic floors, 3 windows to central break. Rendered, paired Doric pilasters to ground floor centre with entablature over. Double doors to centre in flanking lights under arched traceried fanlight, lintel extending to form string course between pilasters. Single storey music room to left; 3 bays with stone angle quoins and aprons below the windows. Stone balustrade over eaves cornice with urns on square newels to ends. Stone coping to shaped gable end to left. Central ridge lantern under dome and sphere finial, Three 15-pane sash windows under gauged brick and stone keystoned heads, alternating with arched niches under cut and rubbed brick garlands. Interior:- Library: Formerly the drawing room. Fine Adam panelled ceiling with central circle. Neo-classical Piranese type of decoration with classical figures. Gilding and painting of Edwardian period. Fine overdoors. Drawing room: Formerly State Dining Room: Adam ceiling with central oval with scroll and shell patterns. Fine gilt cornice with dolphins and further scrolls. Fine large fireplace possibly by Rysbrack in white marble.Large caryatids supporting overmantle with central carved panel containing chariotfigure. Dining Room: Created at end of C19. Gilt panelled and plasterwork ceiling. White and coloured marble fireplace. Modillioned eaves and egg and dart door mouldings. Morning Room: Formerly the Lesser Dining Room. Scroll and dolphin freize, modillion cornice. The Garden Hall: Former main entrance: By Joseph Bonomi neo-classical style, black and white marble floor, with arched niches containing classical figures. Fine ceiling rose. The Boscawen Room: shallow gadrooned plasterwork ceiling. The Staircase Hall: Plasterwork frames on walls by Robert Adam, as is panelled ceiling. Further plasterwork musical instruments and high relief foliage added to end of C19. The Music Room: Domed ceiling with central garland-edged oculus. 2 Ionic columns to each end of the room support outer edge of dome. Organ case with putti and swan neck pediment by Aumonier, organ itself by J. S. Walker. PEVSNER: Buildings of England, Surrey (1971) pp 309-311. COUNTRY LIFE: Articles; 17th September and 1 October 1953. (Map Ref 19). TQ 05SE EAST CLANDON C.P. THE STREET. Hatchlands GV I Country House. Early C20. Red brick with rendered cement dome. Built into hillside. Dome exposed above ground level. 3 bay entrance front with central round arch on Doric pilaster piers, recessed panels to side bays. Interior: Brick and render-lined chamber 20' deep. Included for group value m+y. Ice House 200 yards South East of Hatchlands GV II Icehouse. 1889 by Halsey Ricardo. Red brick with hipped slate roofs. U shaped plan around central courtyard. Central 2 storey pavilion with single storey wings to either side, return wings projecting to ends. 2 storeys to left, one storey and attic to right. 3 bay central pavilion with moulded eaves cornice, and central wooden, domed open lantern to roof. Glazing bar sash fenestration, 2 windows on each floor under gauged brick heads. Central left door to first floor, door to ground floor below. Single storey wings to sides with low red ridge lanterns under pyramidal roofs. One sash window and door to each side, deep recessed bay in re-entrant angles. Right hand Wing: 2 stacks, attic under 2 eaves dormers, with 3 windows below. 3 garage doors to ground floor right. Left hand Wing: 4 stacks. 7 first floor windows and 2 ground floor doors. (Map Refs 20, 21 and 22). TQ 05SE EAST CLANDON C.P. THE STREET. Stable Block to Hatchlands GV II Stable block and service court to Hatchlands. 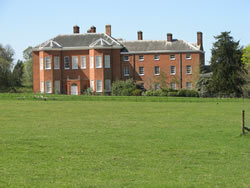 C18, moved to Hatchlands in 1953. 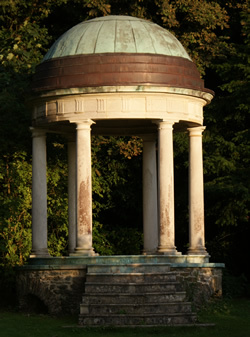 Stone, with stepped copper dome. Circular on stepped base. 6 Doric columns support tinglyph freize. 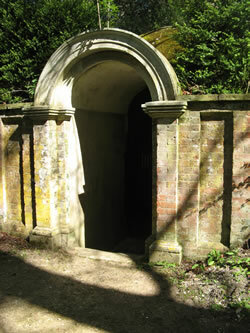 Inscription around base reads: "This temple was brought AD 1953 from Busbridge Hall to stand here as a memorial of Rose Ellen Cooper, 1863-1927, who long lived and loved Hatchlands, the house successively of her father and her son". 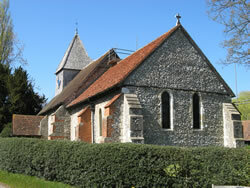 (The temple has been listed as item number 14/6 in the Parish of Busbridge: Waverley District). Temple 100 yards south of Hatchlands GV II Garden Temple. 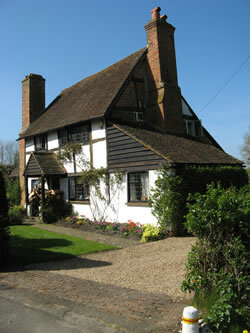 The Village also features 14 Locally Listed Buildings.